How would you describe the principles of FNMR – how does it work? What is the overarching purpose of doing Farmer Managed Natural Regeneration? What were its origins, how did you discover it? My information is that geographically, the origin of FNMR is Niger. Is that right? What does a FMNR programme look like? What are the benefits of an FMNR program? How much does it cost to implement an FMNR programme? Is there any guidance given to the farmers with regards to the right amount of trees providing disbursed shade in their fields? Some of the pictures seemed to indicate a fairly carefully planned distribution of trees? Do not some trees compete with crops for nutrients from the soil? How des FMNG handle this reality? Is FNMR spreading, and if so, to what countries? Do you have an example of a good FMNR learning site? In East Sumba Indonesia it appeared there were lots of plant buds in good condition to be maintained for FMNR. Upon further inspection they turned out to just be old plants. Because they are burnt or eaten by animals it made their growth stunted. Is there an age limit of plants that will be maintained for FMNR? Haharu area is sedimentary rock that cannot be penetrated by roots of trees. Only grass that can live on it, on a layer of soil about 30 cam only. Is it possible do FMNR in land with sedimentary rocks? Or should select the area that have a thicker layer of soil so that the tree can grow well? If communities are already practicing a traditional form of FMNR should you introduce the principles of FMNR to them? Will this help or hinder? Many seemingly barren landscapes are endowed with what I call the ‘underground forest’. That is, beneath the soil on many landscapes lie a rich expanse of living tree stumps, tree roots and tree seeds. Given a chance, i.e. by stopping burning (which destroys the regrowth) and stopping indiscriminate harvesting of ‘suckers’ (stems or re-growth from tree stumps and roots, or from sprouted seeds in the soil)and by stopping continuous grazing by livestock until this tree growth is old enough and strong enough to not be damaged, a forest can quickly and very cheaply be regenerated. So the first principle is that, very often the forest is already there, but it is underground and we simply need to give it a chance to get established. i.e. FMNR does not depend on tree planting. The second principle is that selective pruning and thinning of this regrowth is very beneficial for the growth and the form (shape) of the trees. Correct pruning seems to stimulate rapid growth and results in taller, straighter, more useful tree trunks being formed. Integrity of the environment is crucial for attainment of child wellbeing outcomes, whether they be food security, freedom from grinding poverty, or simply the opportunity to grow up in a healthy environment. FMNR is a tool which can significantly contribute towards the creation of a healthy, functioning and therefore productive environment, which in turn, makes sustainable development possible. FMNR has been practiced in one form or another for centuries in various parts of the world. The technical terms are pollarding and coppicing. In my work today I regularly come across individuals and farming communities around the world who have devised a form of FMNR through their own intuition and experimentation without external influences – so the point I’m making is that FMNR is not really new at all. However, the origins of this ‘movement’ are in Niger Republic in the early 1980’s. I had been struggling to convince villagers in the Maradi region to plant trees, and in any case, our conventional tree planting approach under the prevailing harsh conditions were a failure. I had tried every best practice that I knew of but the results were singularly unimpressive. One day I was delivering a trailer load of trees to a village. On the way I stopped to adjust the air pressure. As I looked out across the landscape – N,S,E,W – I knew it was impossible – even with millions of dollars, many years of effort and a large labour force, I knew I wouldn’t have an impact at this rate. At that point I saw for the first time what I had been seeing for three years without seeing – hundreds of insignificant desert bushes strewn across the farmland. On closer investigation I realized that they were not bushes at all – but indigenous trees which had been felled, but were regrowing from the stumps. Each year as a part of routine farmland preparation for sowing, this regrowth would be slashed and burnt – so the ‘trees’ would always appear as bushes at best, and as invisible at worst, immediately after slashing. At that moment, everything changed and I knew that this was the solution. It was not primarily a technical problem of how and when and what tree to plant – it was more a social and legal problem of why people cut down trees in the first place, why they preferred to have a barren farm with no trees and what laws were in place which acted as disincentives to leave trees on private land. as I mentioned, the current movement originated in Niger, but I am regularly hearing stories now about other movements, so there is over 500,000 ha. of FMNR in the Sena plains of Mali, and there is an indigenous movement in Malawi, early estimates of the spread of Faidherbia albida (a valuable fertilizer tree)on farmland in Ethiopia through FMNR is that there are > 1 million hectares – as far as we know these movements are not connected to Niger. Because it is so simple, cost-free and has a rapid impact, its not surprising that various peoples around the world have stumbled on the same idea – though the species used, the number of trees people leave per hectare and the way they prune them will vary from place to place, they more or less follow the principles outlined above. What does an FMNR program look like? At its core, FMNR is about empowering people – it’s about giving them the knowledge and skills they need to sustainably manage their environment and it’s about facilitating the creation of an enabling policy, social and economic frameworks so that people are free to do the work, secure in the knowledge that they will benefit from it. In development speak, this would mean awareness creation through workshops and exchange visits, training in the methods and close follow-up, setting up social institutions such as farmers clubs, women’s clubs, children’s clubs and cooperatives, having all stakeholders decide on and self-enforce by-laws for natural resource management and advocating and working with government to pass laws which give people the right to sustainably utilize the resources (trees, land, fodder, water) and benefit from their work. There are too many to list here. As one evaluation found “FMNR represents one of the rare projects that could be designed to have the broadest coverage of all children in the ADP in terms of coverage of tangible benefits and its potential for involving children in the design, implementation, monitoring and evaluation of activities. No other ADP component offers such holistic opportunities for children as FMNR does. No cultural barriers prevent open dialogue between parents and children on FMNR issues. Because women and children already provide 90% of the household agricultural labour FMNR could become a strategic liberating mechanism for children and women and empower them to play their rightful roles towards building a future that is better than the one they would otherwise passively inherit from their parents. FMNR is proving to be a catalyst for mobilizing people to take positive action to improve their life situation. By its nature, it requires the bringing together and collaboration of all stakeholders, and thus by default, giving voice and recognition to the poor who depend on natural resources for their livelihoods. It provides women and children with a voice, dignity and a means of meeting basic needs directly (food, fodder, wood) and indirectly through income generation. On farmland FMNR makes a positive contribution to soil fertility, animal productivity and crop yields. 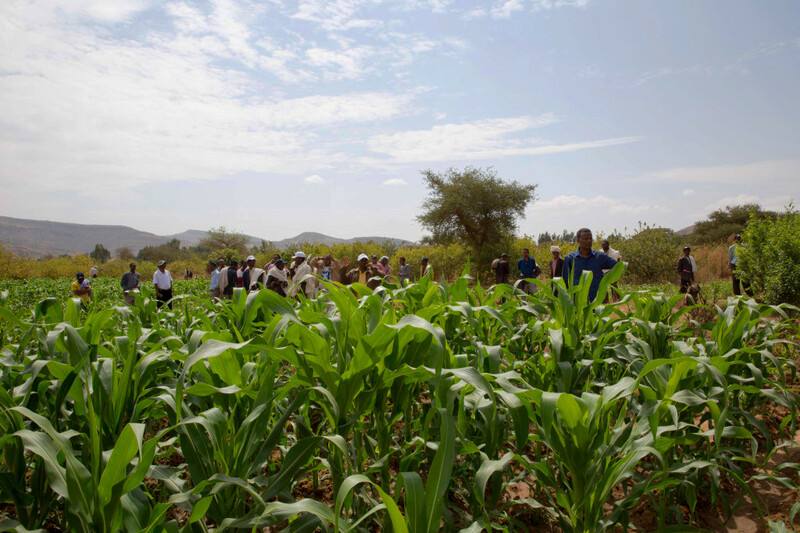 Farmers practicing FMNR have greater resilience in the face of environmental shocks such as drought, flood and insect attack and they are less prone to famine. FMNR provides an alternate and more secure income stream than simple reliance on annual crops which are more subject to the vagaries of the weather. FMNR provides a means of environmental restoration; hence it slows species loss, enhances biodiversity and biomass in an ecosystem, reduces soil erosion, water runoff and evaporation and contributes to greater water infiltration and storage in the soil. How long is a piece of string? FMNR can and does cost absolutely nothing. This is the case in Niger Republic where some 5-6 million hectares have been reforested over the last 20 years largely by word of mouth with the idea spreading without government or NGO intervention from farmer to farmer. Human and financial resources will depend on the nature and scale of the promotion program. The budget might be as little as $10,000 – 20,000 per year for such costs as exchange visits, promotion and follow up, to $100,000 – $200,000 per year, for a project involving advocacy, district wide promotion and follow up, assistance with cooperative formation, registration, formal creation of by-laws etc. The short answer is no, because farmers tend to do what they feel comfortable about in any case. When we started promoting FMNR we gingerly suggested 20 trees/ha. Knowing that farmers believed trees competed with crops and they would fear reduced crop yields if tree density was too great. Farmers soon saw that there was no overall negative impact on yields. So we began suggesting 40 trees / ha. Again, farmers saw no net decline in yield, and if anything, an increase, and they had the additional benefits of FMNR. Today, on average in Niger, farmers are leaving 40-50 trees/ ha. But some farmers are leaving 100-150 trees/ha, and still getting a crop. The paradigm shift has been from ‘trees are weeds to be dealt with’ to, ‘trees are an economic crop in their own right, and they contribute to annual crop yields’ – and this is a very big change. In fact farmers have a very high degree of control over the impact FMNR has on crop yield through FMNR – a) they can choose which species they will regenerate (out of the mix of species present) b) they can choose the density of trees they regenerate c) they can alter how severely/moderately, how often and how they prune – giving great flexibility on impact of shade and competition for moisture and nutrients. If the common practice has been to leave no trees on fields, my advice would be to start promoting a low number – something that will be acceptable, or, if farms are large enough, promote FMNR just on say 25% of the land, at say 40 trees/ha, and then each year, have discussions with farmer groups and get their feedback and together, formulate guidelines. This does not sound very scientific, but at the end of the day, it is the farmers we are aiming to convince, not the scientists. Experience has shown that as farmers begin to experience the benefits of FMNR and as they become more confident, they themselves will begin to experiment with different tree densities. Don’t some trees compete with crops for nutrients from the soil? How does FMNR handle this reality? Yes. Generally, farmers are well aware of which trees compete heavily with crops and they will avoid regenerating them in their fields. I think that emphasising the “Farmer Managed” part of FMNR is very important. We don’t go in with a blue print and say “this is how you have to do it”, but we work with farmers and encourage them to use FMNR to achieve their objectives, which incidentally can be quite different from farmer to farmer. There are trees such as Faidherbia albida which are extremely valuable in agricultural land because they fix nitrogen and in the rainy season they shed their leaves, resulting in a light dappled shade which protects crops from extreme temperatures but does not reduce crop yields. Additionally, during the dry season, Faidherbia produces seed pods which are sought out by livestock, so animal nutrition improves, and in the process, the farms containing Faidherbia trees get free fertilizer. There are many other naturally occurring species with synergistic traits beneficial to crop production. Often (but not always) farmers know which ones are which. It’s very important to encourage experimentation as there is so much to be gained by trial and error and farmers are great observers and will modify their practices according to their experiences. Farmer Managed Natural Regeneration (FMNR) is a rapid, low cost, easily replicated approach to restoring and improving agricultural, forested and pastoral lands through reforestation and agroforestry. FMNR is based on the systematic re-growth of existing trees or self-sown seeds, and is possible wherever there are living tree stumps or roots with the ability to coppice (re-sprout) or seeds in the soil that can germinate. FMNR generally has an extremely high success rate and once adopted by a population can spread very rapidly from one farmer to the next because of its ease of adoption, low cost and lack of dependence on external resources or expertise. In one study, the cost of FMNR implementation per hectare was $4.00 compared to $150+ per hectare for tree planting. Tree planting requires the establishment of a nursery in which tree seedlings are raised in planting pots or in garden beds and then transplanted when mature enough and conditions are right. This can be a costly exercise in terms of money and labour and results are very variable and often extremely poor particularly in difficult climates. FMNR relies primarily on the existence of indigenous tree stumps, roots and seeds in the landscape and it is these species which are regenerated. Tree planting approaches allow for the introduction of indigenous and exotic species and gives the farmer more choice e.g. high value fruit or timber trees can be introduced to an area through tree planting. Normally, the first step is to promote FMNR because it has low or no cost, it is very easy and replicable and the benefits can be realized from the first year onwards. In any case, most countries around the world have experienced devastating degradation and loss of indigenous biodiversity, and this needs to be addressed. Because of these factors, FMNR is and likely always will be the main activity promoted. In Niger Republic over a twenty year period, more than 5 million hectares of land now have an average indigenous tree cover of 40 trees per hectare with some farms containing 100 to 150 indigenous trees per hectare. In Senegal over a five year period, some 62,000 hectares of previously cleared farmland have been regenerated through WV FMNR programs. By comparison, and to put tree planting versus natural regeneration into perspective, much less than 1% of these same areas have been planted with exotic species. Why then do we promote both natural regeneration and tree planting? Usually demand for tree planting comes from the farmers themselves. One of the limitations of natural regeneration is that you cannot regenerate valuable timber, fruit, fertilizer or fodder trees if they were not there in the first place. Very often farmers have seen the benefits of growing such species as Mahogany, Teak, Mango, Etc and as with the annual crops that they grow, they want to plant them to improve their income or food supply. In some cases, fast growing exotic trees can be harvested for firewood and timber taking pressure off remnant indigenous trees. In Niger, Acacia colei produces five times more biomass than indigenous species. In an effort to protect indigenous trees, the Niger government taxes wood of indigenous trees, but not that of exotics such as A. colei and Neem and so farmers like to grow exotics to avoid the tax. In some settings, such as E. Sumba, Indonesia, the indigenous sandalwood has all but become locally extinct due to over extraction. In such cases the only way to re-introduce it is through planting (tree planting does not always involve planting exotics). Again in E. Sumba, local people have not found a compelling economic reason to regenerate indigenous species – there simply isn’t a market for the wood or wild fruits. There we have used environmental reasons to promote FMNR – less flooding, recharged water tables, and co-benefits of more fodder (in order to succeed, setting fire to grasslands must stop). Even so, people need to live and want a better life for their children. By promoting FMNR along with tree planting, a much greater participation rate has been achieved. Are non-native species assessed for potential risk of invasiveness? Most non-native species being planted through WV programs are already present in the countries concerned and are already promoted by the national governments. WV has not undertaken weed assessments on species which have been introduced by the government and which have not posed a weed threat after many decades of being planted. Species already promoted by governments include Neem, Grevillia robusta, Mahogany, Teak and various fruiting species, depending on the country and climate. In West Africa and Ethiopia WV is involved in promoting some Australian acacia species and in this case, weed assessments are ongoing. Acacia species including A. colei (formerly A. holosericea), A. tumida and A. elachantha were introduced by some W. African governments in the 1970s in response to desertification. In over 40 years they have not become weeds in these countries. WV is involved in testing and promotion of acacias because of their multi-purpose uses (building poles, fire wood, protection from wind, shade, pollen for honeybees, nitrogen fixing properties, land regeneration, fodder value, human food and income generation) in the poorest regions of the world where malnutrition rates are unacceptable. Is FMNR spreading, and if so, to what countries? Yes, very much so. Within WV operational areas FMNR is practiced in 25 countries and spreading. The World Agroforestry Centre, Africa Regreening Initiative, Africa Forest Forum and other NGOs are promoting FMNR vigorously. There are indigenous movements in Mali, Malawi and other places which seem to be spontaneous and independent of external influence. How do you incorporate FMNR with ecotourism? In Kenya World Vision built a multipurpose community meeting hall. It is used for activities such as health care and lessons, planning etc. but now it is also the meeting place of the FMNR development group and on the fenced compound surrounding the hall, they have pruned the tree stumps. Now this is used as a kind of visitors centre where talks are given, presentations are made and refreshments are served after field visits. It is also the FMNR groups meeting place and they have been able to invite politicians and influence FMNR. Some plants may be hundreds, if not thousands of years old. For example, there are famous tea trees which date back about 1,000 years. That is 1,000 years of continuous pruning for harvesting the growing tips – which is really a form of FMNR! Da Hong Pao (Big Red Robe) is a Wuyi rock tea grown in the Wuyi Mountains. It is a heavily oxidized, dark oolong tea. According to legend, the mother of a Ming dynasty emperor was cured of an illness by a certain tea, and that emperor sent great red robes to clothe the four bushes from which that tea originated. Six of these original bushes growing on a rock on the Wuyi Mountains and reportedly dating back to the Song dynasty, still survive today and are highly venerated. Famously expensive, Da Hong Pao can sell for up to US$1,025,000 per kilogram or US $35,436 per ounce (20g of Da Hong Pao tea from one of the mother plants was sold for ¥156,800 in 1998). FMNR might be possible in these difficult sites, but growth could be very slow. So that people do not get discouraged it is better to concentrate on the higher potential areas first – areas where trees can grow faster – areas with deeper soils and where tree roots can penetrate. Ultimately, for the health of the landscape it is important to restore all areas, but the harder areas may take more time and may need more work – such as digging of pits to catch water and soil and even tree planting. Thus areas with shallow soils and a rock base might need mechanical intervention to make openings in the rock for roots to penetrate – either with machinery, or if people are prepared to do the work, with hand tools likes picks and crow bars. If people go to this trouble, it might be better to concentrate on planting higher value fruit or timber trees in the dug holes. You will have to use your judgment as to what is best and what the people will accept. In the traditional method do they prune and thin the trees – or do they just let them grow with no management? If they just let them grow, then FMNR introduction will help them to get more benefit from their trees. If you find that what they are doing works very well and does not need changing – then perhaps the next step is to challenge them to expand their area of traditional FMNR. The good thing is that they are doing something and this must mean that there is a binding agreement between them already on allowing the trees to grow, on managing animals and fire and on harvesting. So it’s important to praise and acknowledge the very good things they are doing first of all. If you think that FMNR can improve on what they are already doing, we can then use this traditional FMNR as a foundation for FMNR for the FMNR techniques we are introducing.